Okay, so apparently there is going to be a part 3 too! I have added another display this year due to my expanding collection, so stay tuned for the final installment of Home for the Holidays artgoodies style! 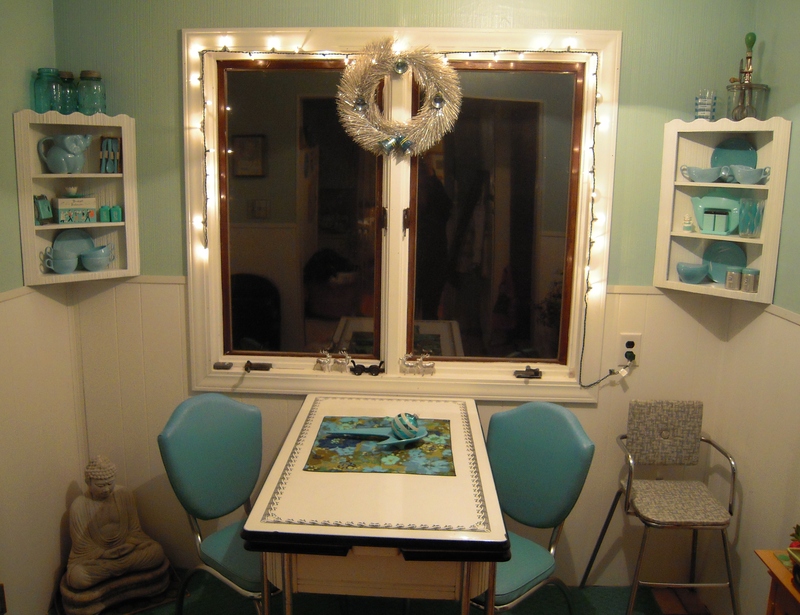 New this year is the window sill display in the living room right under the vintage felt Christmas banner. I love these vintage deer! Most of them made in Japan. 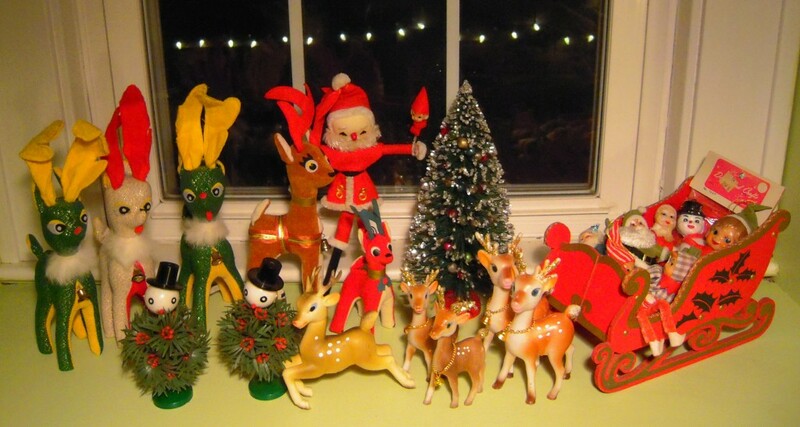 And that lanky Santa next to the bottle brush tree and the sled of friends, this is good stuff! These guys are so fun and festive! 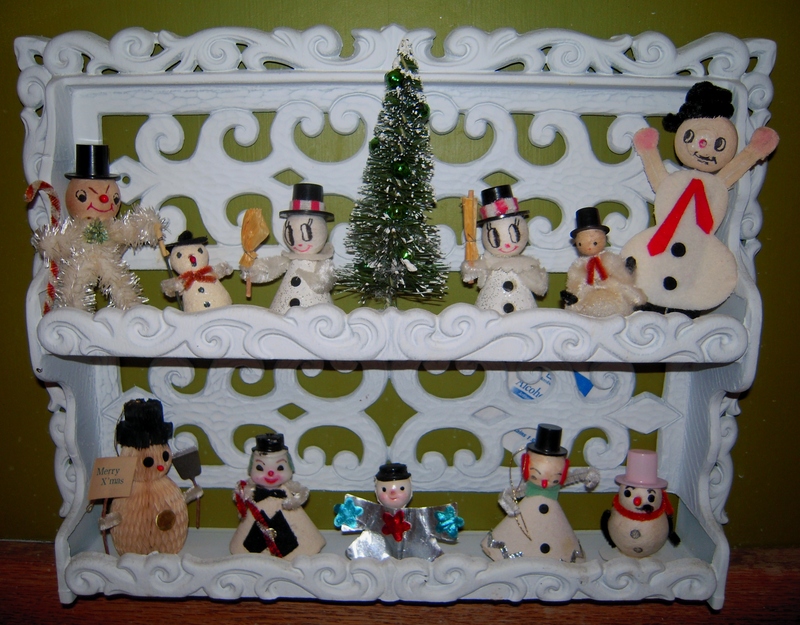 This little snowman collection sits on the shelf right above the bathroom sink. My faves are the grumpy one on the top left, and the cigar smokin one on the bottom right! 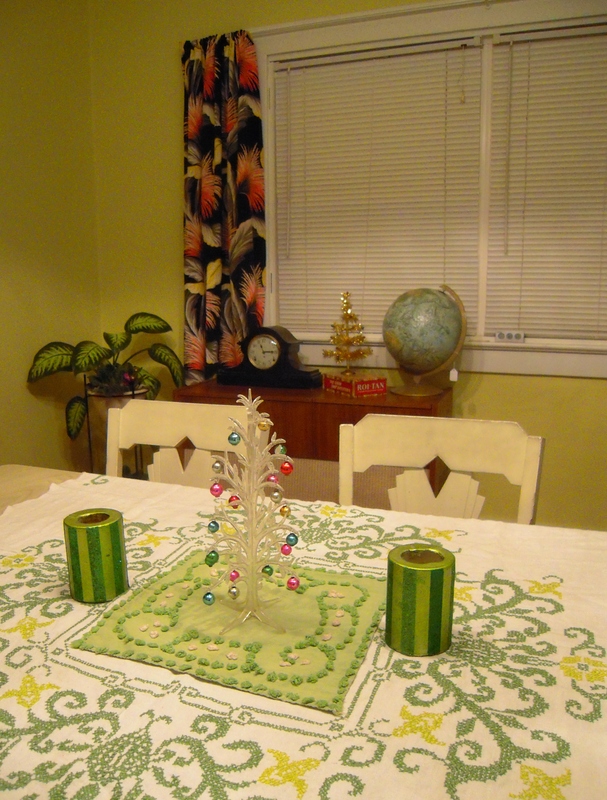 This year the table gets decorated with an unusual shiny bright tree! Made of clear plastic with silver glitter, the branches have little notches to hold the tiny glass balls! Plus on my vintage console radio sits a little gold tinsel tree from Japan. And I couldn't be more excited, I finally put up my grandma's 40s black Zomba barkcloth drapes after finding them when my parents moved this summer. I spent countless hours lying in bed at her house staring at these drapes! I love them! They fit right in with my wall color and the German console radio I also brought over from my parents house. It used to belong to my Grandpa Price and still works and sounds like a dream! I wanted to give you a sneak peek into my vintage holiday decor. 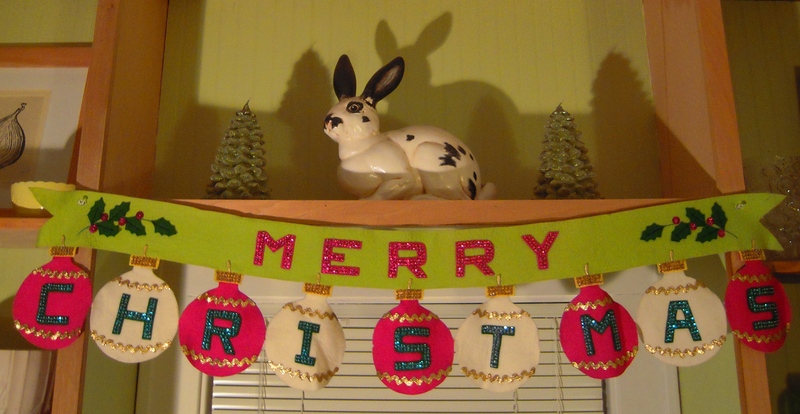 It’s fun, it’s kitschy, and most of it is less than traditional which is how I like it. From my mini tree to my ever expanding Blue Christmas theme, this is part one. Stay tuned for part 2! This vintage felt banner is amazing! The lime green and fuschia colors are a nice twist on traditional red and green. Plus the hand sewn quality and beaded sequints letters are amazing! What can I say, I love a Blue Christmas! My breakfast nook takes on a little holiday sparkle with the lights around the window and the fantastic vintage silver wreath I picked up this past year. I attached some blue vintage bells to it, the giant blue striped ornament is cozy in the boomerang pottery piece, and the silver reindeer happily march along the windowsill! Buddha comes in from the freezing winter garden and hangs out in one corner while in the other, a fantastic gray and white mid century booster chair is ready for the arrival of any little holiday visitors! Every year I get one of these little live mini trees. Just enough for the festive feeling. This year the kitchen cart I picked up comes in supremely handy for displaying the tree and keeping the presents neat and tidy! Decorated in green and blue ornaments, plus some beaded snowflakes my mom made, and of course the addition of some vintage holiday goodness it has just enough sparkle! And my rare vintage Rushton pink Santa hangs out below. The busy season is busily coming and going folks! Holiday orders, shows, and other activities like my brother’s wedding have kept me on the move! Here’s a few pics for you! And there’s still plenty of time to get your artgoodies products this holiday! Tea towels make the perfect gift for just about anyone, and don’t forget the New Year’s hostess! Piority shipping upgrade suggested to insure holiday arrival, order by the 20th! Say hello to my latest design! 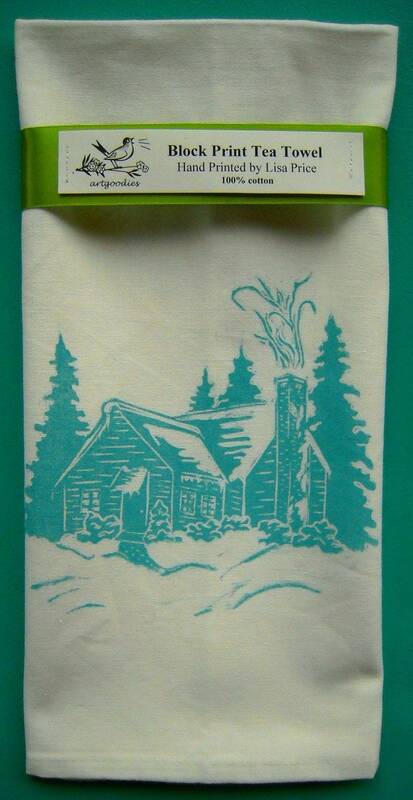 The cozy cabin towel! It reminds me how nice it is to shop online at home, nice and snug and warm as you sip cocoa, hint hint. 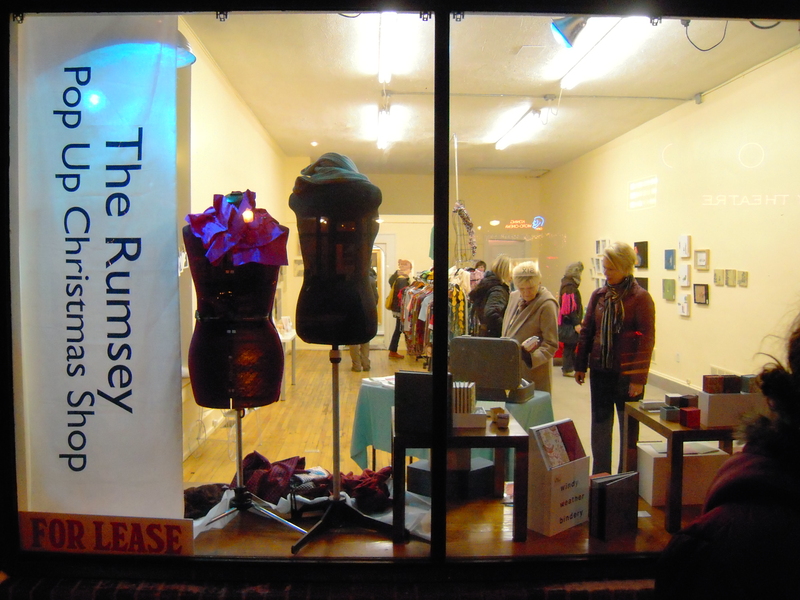 artgoodies is participating in the local pop up shop put on by the fantastic Rumsey's! If you're local or in GR for the day stop on by at 1127 Wealthy St SE, right across from the Wealthy Theatre. It closes up Sunday so hurry on over and support all the local artists involved! 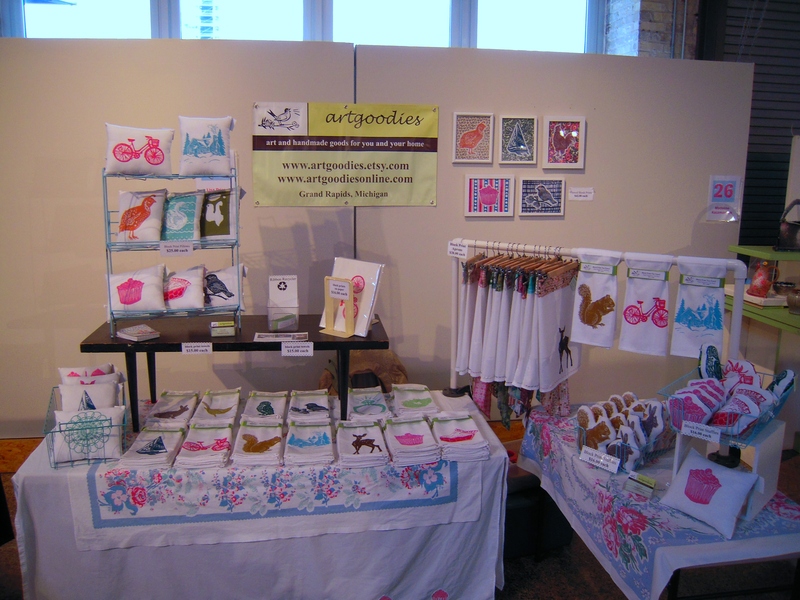 Here's my booth at the UICA holiday artist market here in Grand Rapids. I kept it local this year due to my brother's wedding and I have to say it was so nice to stay home, but I did miss all my customers and indie friends in Chicago! I’m a bit deliquent on this post but here it is. 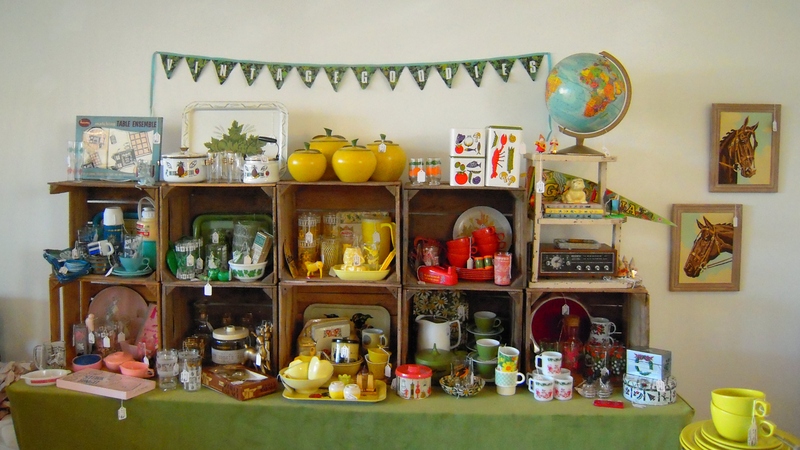 I had a fantastic Thanksgiving holiday weekend hanging out at The Vintage Bazaar in Chicago. The pop up store front was amazing I might add! Everyone’s displays looked fantastic! Katherine and Libby were the hostesses with the mostess- thanks ladies! The inspiration for my display! 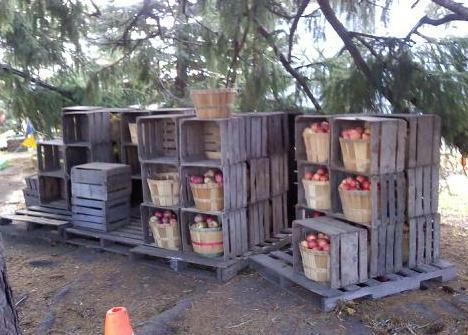 I love how the color of the apples pop right out of the weathered wood! Here it is! The main wall, and my favorite part of my display at the show! I love how it came together! And the dual action crates worked great for packing it up too! 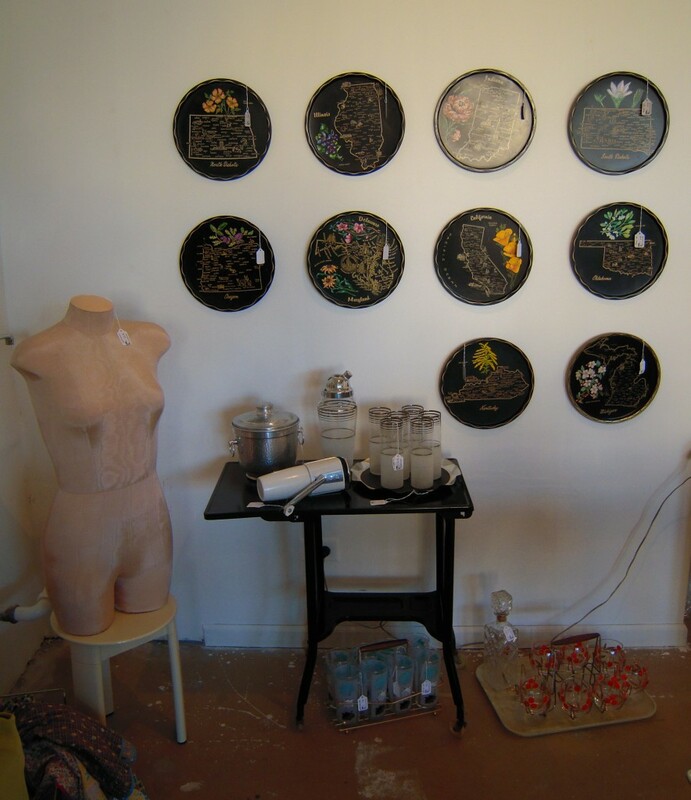 This wall of state trays looks swell with the mannequin and the cocktail set on the typewriter cart!